Growing up, bread literally permeated my town. Downtown, the sweet perfume from a Sarah Lee-turned-Bimbo plant competed with the musky haze emanating from City Brewery’s smokestacks (an interesting lesson in the varied olfactory directions grain products can go). Local supper clubs - those ubiquitous mid-century Midwest institutions - still persist, and persist in placing bread baskets filled with rye toasts, rolls, and pinky-sized breadsticks on every table with butter (never margarine). Despite - or perhaps, because of - Wisconsin’s preoccupation with butter and cheese, the bread on my table at home was never of the utmost concern. Most often we’d have wheat by “Healthy Choice.” Occasionally we’d have a fresh loaf from the bakery in the grocery store. Very occasionally on her commute home, my mom would pick up a beautiful country loaf or sourdough from Linda’s, a local bakery to some, a small luxury to us who lived 4 valleys (30 minutes) away. 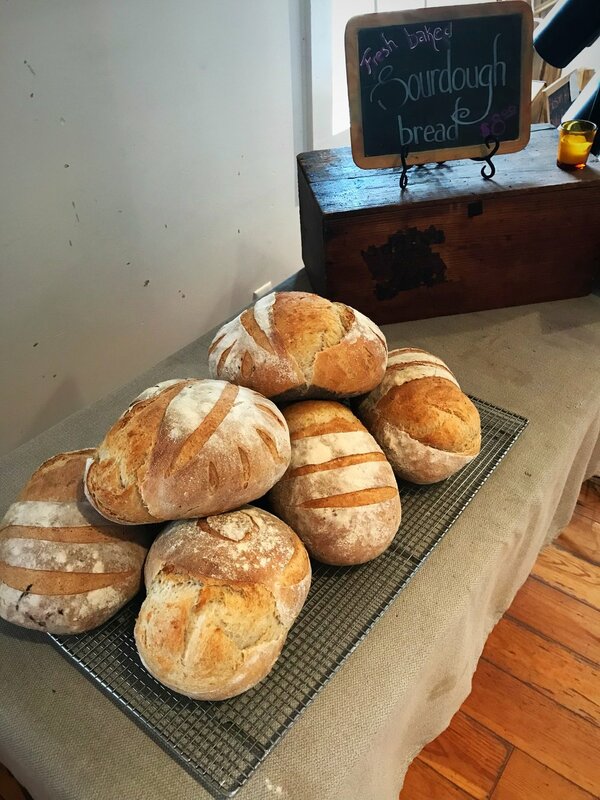 The most artisan breads I knew were another bakery’s, Fayze’s, cultish Talame buns - a Labanese white bread roll, buttery, lighter, and flakier than American dinner rolls - and Communion wafers made by the nuns at the diocese abbey. That said, artisanal access be damned, bread is bread, and I, like everyone whose body allows, love it. I’d never really made bread though, until I started working at the school. Of course I’ve made my share of sweet breads, those delicious “who-are-we-kidding-this-is-basically-a-cake” loaves (looking at you banana “bread”). I’ve even had the occasional impulse to try to make a yeasted dough, though those results have been middling at best. On top of not having baked much, I’d also never exactly considered myself the baking type. I’ve always been drawn to cooking for it’s improvisational nature, the ease with which knowledge of a few techniques can transform good ingredients into seemingly endless variations. Baking, to my mind, felt penned in and scientific, the difference between deliciousness and disaster a quarter teaspoon of yeast, or confusing baking soda for powder. Cooking was jazz, baking classical, and I had as little desire to make croissants as write a sonata. In retrospect, I realize that this distinction between cooking and baking, though apt in many ways, was partially borne of laziness and lack of time (and also because I don’t particularly like having dough stuck to my hands). I can recognize in myself the disposition of a baker - obsessive, methodical, self-critical - and I think was afraid to introduce another hobby to my life that would inevitably take it over. Baking, especially bread making, was my Pandora’s box and I didn’t want to open it. And then, when I started at the Cooking School, I was forced to.